Flash Fiction Friday has rolled around once again! Everyone interested in our twitter competition should follow the Creative Writing twitter (@YSJWriting) to enter. 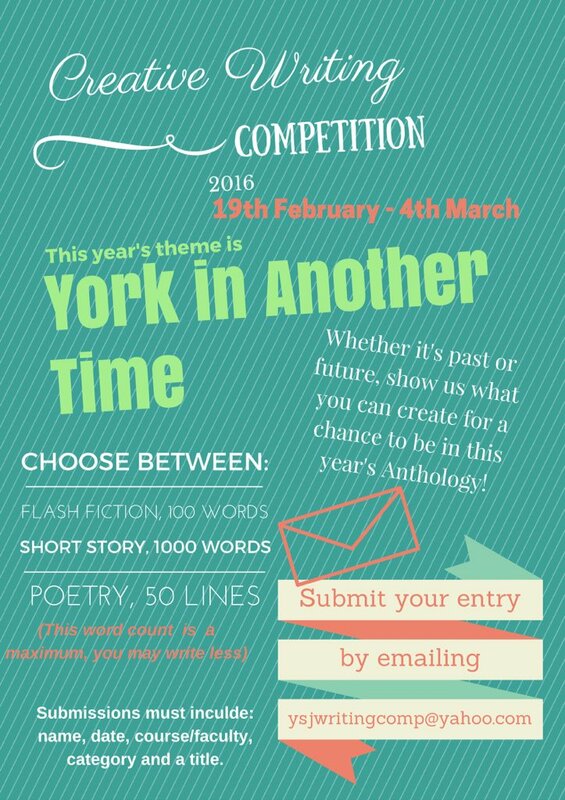 Just fit your story into 140 characters and use #YSJFF to enter! This entry was posted in Uncategorized and tagged creative writing, flash fiction, flash fiction competition, Flash Fiction Friday, twitter on March 4, 2016 by jessica.osborne. All staff and students at YSJ are welcome to submit their work! Winners will get published in this years Creative Writing Anthology. This years theme is York in Another Time! Get scribbling! This entry was posted in Uncategorized and tagged competition, creative writing, fiction competition on February 24, 2016 by jessica.osborne. We’ve had an amazing semester here at YSJ Writing. We have been treated to Claire Trevien’s flawless and haunting performance of The Shipwrecked House; we’ve met David Varela who introduced us to the many possibilities of writing, from interactive Sherlock Holmes mysteries to running from zombies to keep fit. MA graduate Nuala Casey read from her second novel, accompanied by Lucy Atkin who gave a generous account of how she’s made a success of her writing. In November, we were also treated to a brilliant masterclass with playwright Vivienne Franzmann and producer Imogen Ashby, who spoke to our scriptwriting and theatre students about their work with women in prisons. And most recently, our own Dr Alex Beaumont interviewed acclaimed novelist Maggie Gee. Not only that, but students from the MA and 2nd and 3rd years of the BA in Creative Writing took part in an atmospheric writing retreat in Whitby. After travelling over the moor as the mist rolled in, we all piled into the YHA’s historic hostel, up on the clifftop next to the gorgeous ruins of the famous abbey. Over the next two days, students wrote in the shadow of the abbey, in the jumbled streets of the town, and out on the beach inspired by driftwood and thoughts of washed up vampires. Then they gave a fabulous reading to showcase their spooky tales. Next semester, we have even more to look forward to with the York Literature Festival which includes Quick Fictions; Evie Wyld, Jenn Ashworth and Emma Jane Unsworth; 24 hour Playwriting; Claire Pollard’s Ovid’s Heroines and much more…We can’t wait! This entry was posted in News, Student Success Stories and tagged claire trevien, creative writing, Daivd Varela, digitial writing, dracula, shipwreck, Whitby, whitby abbey, writing retreat on December 17, 2014 by a.curtis.